Abstract: Globally, the appetite for higher education is great, but what do students and societies gain? Quality in Undergraduate Education foregrounds the importance of knowledge acquisition at university. Many argue that university education is no longer a public good due to the costs incurred by students who are then motivated by the promise of lucrative employment rather than by studying a discipline for its own sake. 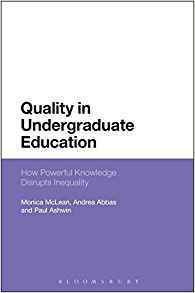 McLean, Abbas and Ashwin, however, reveal a more complex picture and offer a way of thinking about good quality university education for all. Drawing on a study which focused on four sociology-related social science UK university departments of different reputation, the book shows that students value sociological knowledge because it gives them a framework to think about and act on understanding how individuals and society interact. Further, the authors discuss how what was learned from the study about how policy, curriculum and pedagogy might preserve and strengthen the personal and social gains of social science undergraduate education.